This delicious dessert is great for entertaining, because there is not cutting and serving involved, and guests can serve themselves from a buffet. We've also included a variation made with fresh peaches below. You could make both types for a party, they'd look wonderful served together. To make the pastry in a food processor: Process the flour, sugar, and salt to blend. With the machine running, drop the butter through the feed tube and process with on/off turns until the mixture resembles fine crumbs. In a small bowl, beat the cream and egg yolk with a fork until blended. With the machine running, pour this mixture through the feed tube and process until the dough leaves the sides of the bowl clean. To make by hand: In a medium-size bowl, mix the flour, sugar, and salt. Cut in the butter with 2 knives or a pastry blender until the mixture resembles fine crumbs, In s small bowl, beat the cream and egg yolk with a fork until blended. Stir this mixture into the crumb mixture until the dough forms a ball and leaves the side of the bowl clean. Divide the dough into 12 equal pieces. Poll each piece into a ball. Press each ball evenly over the bottom and up the sides of lightly greased muffin pan cups or 3 x 1-inch tart pans. Place on a baking sheet and bake until the pastry looks dry and pale golden brown, 15 to 17 minutes. Set the tarts in the pan(s) on a wire rack to cool completely. Carefully remove the tart shells from the pans. Meanwhile, make the topping. In a medium bowl, crush 2 cups of raspberries with the sugar. Let stand at room temperature for 30 minutes until the sugar dissolves and the mixture becomes very juicy. Press the crushed raspberries through a strainer set over a small bowl to remove the seeds. Stir in the lemon juice. Spoon the filling into the tart shells. Top with the remaining berries and serve. 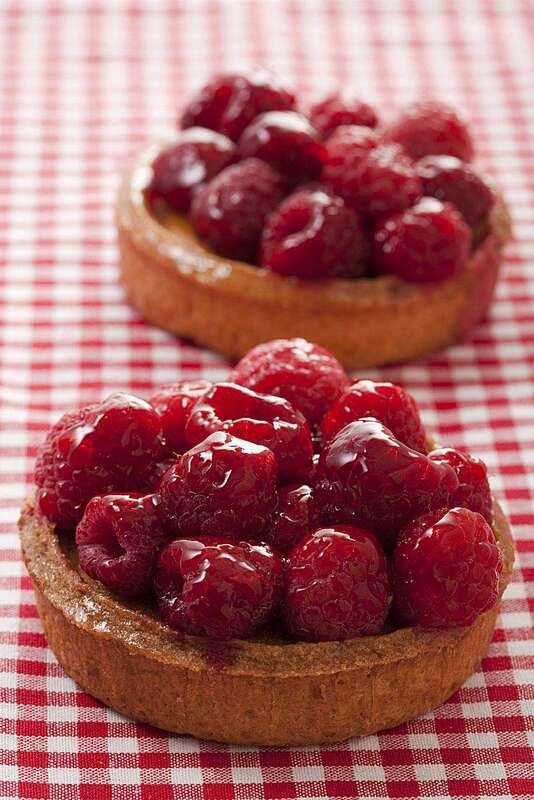 You can store the tarts up to 2 days, covered and refrigerated. Serve them chilled. To make a Spiced Peach variation of these individual tarts: Preheat the oven to 375 degrees Fahrenheit. In a shallow 2-quart baking dish, mix 5 cups peeled, thinly sliced peaches (about 2 pounds ripe peaches), 1/2 cup sugar, 1 tablespoon lemon juice, and 1 teaspoon ground cinnamon. Bake uncovered 8 to 10 minutes, stirring once or twice until the peaches release some of their juices. Cool to room temperature. Fill the tart shells with the mixture.